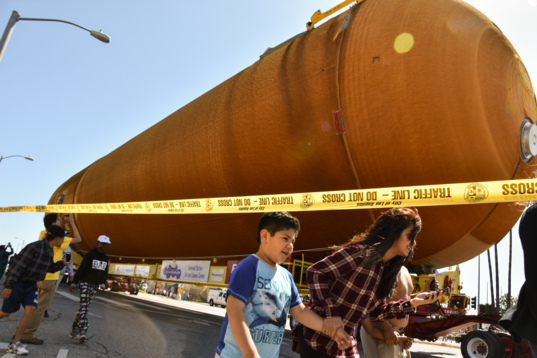 After a 41-day journey marked by stormy seas, a trip through the Panama Canal and a rescue off the Baja California coast, the last unflown space shuttle tank has arrived at its new home here in Los Angeles. The tank, ET-94, arrived at the California Science Center at 7:00 p.m. yesterday following a 19-hour drive through L.A., creating scenes reminiscent of space shuttle Endeavour's expedition through the city in 2012. 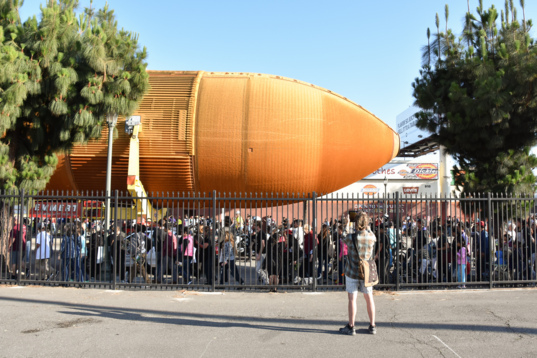 ET-94 is now parked next to the Samuel Oschin Pavilion, which houses Endeavour. The two space relics will be bolted together with a pair of solid rocket boosters, creating a fully stacked space shuttle that will be raised vertically into launch position. The Planetary Society is following the journey of ET-94 from New Orleans to Los Angeles, via the Panama Canal. To see our pictures from Los Angeles, visit our 500px gallery. For previous ET-94 photos, visit our Flickr album. On Friday evening, ET-94 sat bathed in floodlights and the glow of a nearly full moon at Marina Del Rey, a massive artificial harbor northwest of Los Angeles International Airport. Loud music thumped from a nearby tented venue, where science center officials hosted project donors at a reception gala. Just before midnight, the band finished with Creedence Clearwater Revival's "Proud Mary," and the crowd came out to see tank begin its 16-mile roll. A large truck owned by Emmert International, the transporation company overseeing the entire move, idled patiently, ready to begin towing the tank's custom yellow dolly. But at the predetermined departure time of 12:01 a.m., nothing happened. Onlookers watched and waited, until the source of the delay became clear: One final road sign was still in the way. A portable forklift-and-crane vehicle quickly wheeled to the rescue and ripped the sign out of the ground with a chain. A cheer went up from the crowd, and ET-94 headed homeward. 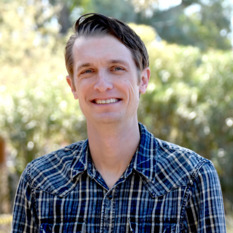 The journey through L.A. was accomplished by an army of support personnel. Emmett International employees walked alongside the track and tank during the entire route, scanning dilligently for potential hazards. Police officers from multiple jurisdictions shooed onlookers to sidewalks (politely, for the most part, except for repeat offenders: "You on the bike—I've asked you three times to stay off the street!"). Other transportation workers closed off side roads and diverted traffic. The move was not as complex as Endeavour's. Though the tank is larger by volume, Endeavour's wings are wider, and its vertical stabilizer is taller. Even so, utility workers still had to raise or remove low-hanging power lines and cables. In at least one case, lines were lowered to the ground, where workers erected a temporary wooden ramp to allow the tank to cross. Many stoplights and overhanging lamp posts were either rotated out of the way or partially disassembled. An occasional tree also had to be trimmed. Just before 9:30 a.m., the tank crossed the 405 freeway. For motorists passing below, the overhead tank must have been quite a sight, and suddenly, there was a loud screech followed by the wincing crunch of two vehicles colliding. Police were quickly on the scene, and the involved occupants appeared uninjured. A small weiner dog escaped from one vehicle and briefly bounded around on the empty freeway before being corralled by its owner. An hour later, the tank made a wide turn north onto La Brea Avenue. A nearby car blared "America the Beautiful" and the theme music from Star Wars, as large crowds lined the intersection to watch. Angelenos from all walks of life were drawn to the tank wherever it went. Some elderly residents claimed lawn chair spots on the route ahead of time, while children preferred to dart in and out of the crowds. Many youngsters watched in awe, with others appearing to relish having their neighborhoods thrown into semi-chaos for a couple of hours. By 3:00 p.m., the tank was on the home stretch of Vermont Avenue, a north-south street leading all the way to Exposition Park and the California Science Center. 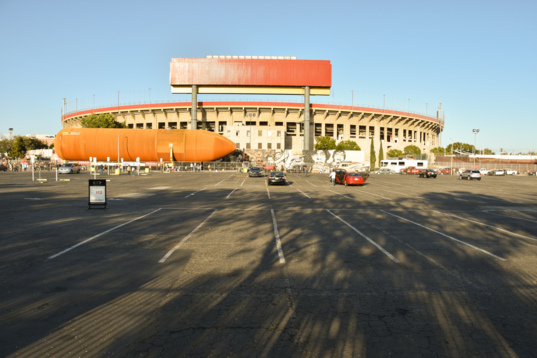 As the sun dipped lower on the horizon, ET-94 made a series of tight turns around the Los Angeles Memorial Coliseum. Its rust-colored exterior meshed nicely with the USC Trojans' red and yellow stadium accents. A massive holding pen had been cleared on the park grass in front of the Natural History Museum of Los Angeles, and at about 7:00 p.m., ET-94 wheeled to a stop next to the Samuel Oschin Pavilion. Onlookers cheered and snapped selfies with the museum's latest exhibit. Today, the tank is expected to be moved to four red pedestals sitting alongside the north side of the pavilion. It will remain there for visitors to see until the project's final assembly and construction phase. Awesome. The title had me envision the tank as it comfortly passed a Star Bucks, much to the surprise of the customers. The described reaction serves to demonstrate the public's emotional investment.